Here Is Next Week's News In Advance -- How Will You Trade It? Let’s say that today is November 25th 2017. And, I will guarantee that, on November 28th2017, North Korea will launch an ICBM towards Japan, one of the main allies of the United States. In fact, Japan will issue an emergency warning, telling its citizens to seek shelter. How would you trade that news? Well, I am quite certain that at least 95% of you would short the market before it closes the day before November 28th, expecting that you are going to make a killing after that geo-political news hits the wire. Well, I hate to tell you this, but you would have been taken to the cleaners in your shorts, as the market not only did not fall after that news, but, instead, it rallied 60 points after that news hit the wires. Now, I am going to challenge each and every one of you who so desperately believe that news causes changes in the stock market. We all know that the September 11th terrorist attack was one of the worst in recent American history. So, those that believe these types of events have a dramatic negative effect upon our markets will certainly be able to pick out where it occurred on a chart, since it was the most significant event of our time . . . right? 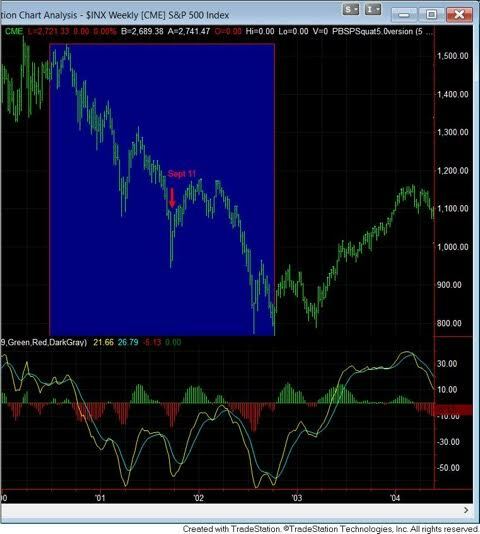 As you can see, we were already in a multi-year decline when 9/11 occurred, and we were closer to a bottom in the market than a top. Moreover, there were even larger drops seen during this downtrend than the one "begun" on September 11th. In fact, the market bottomed the week after the event, and then rallied to a level 10% higher than where we were right before 9/11. Maybe we can actually say that 9/11 caused the selling capitulation we often see at a bottom to the market, and then caused a 20% rally? Well, the facts support such a conclusion, even though the predominant presumptions about how major news events effect the market do not. As I have noted so many times before, this “religion” of correlating news to major directional moves in the market leads many analysts to even force a news event to be the cause of a market move. In fact, it is almost laughable to see how analysts hopelessly attempt to explain what the market did yesterday by fitting their square pegs of linear reasoning into the round holes of non-linear market action. Let’s be honest, how many times have you heard the most ridiculous reasons trying to explain what the market did on a given day? And, even though the reasons are provided after the fact, oftentimes it still sounds ridiculous. Recently, the market dropped for a day due to Starbucks closing its doors that day, as investors were unable to get their caffeine fix. While you thought it was due to issues in Italy, you would be wrong. You see, when Starbucks re-opened, the market went right back up to exactly the point from which it dropped, even though the Italian issues were not resolved. So, it clearly had to be driven by the Starbucks events rather than the Italian one. While I am using this example in a sort of tongue and cheek fashion, are you starting to see my point? You see, there are multiple problems with utilizing this type of analysis for prognostication purposes, which ultimately points out that it is not an intellectually honest way to attempt to prognosticate the market. 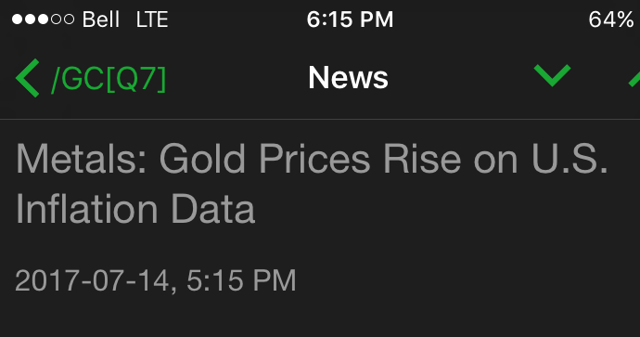 First, you would need to know the news in advance of the market action in order to prognosticate. Second, you would have to assume that the substance of the news would cause a “logical” reaction in the market. But, we cannot know the news in advance of it occurring, and history has shown us that, even if we knew the news beforehand, the market does not always react in the “logical” manner. In fact, based upon many studies of market history, it rarely reacts in the “logical” manner. In a 1988 study conducted by Cutler, Poterba, and Summers entitled “What Moves Stock Prices,” they reviewed stock market price action after major economic or other type of news (including major political events) in order to develop a model through which one would be able to predict market moves RETROSPECTIVELY. Yes, you heard me right. They were not even at the stage yet of developing a prospective prediction model. So, despite what these, and many other studies of market history have shown, what do analysts that believe “the fate of markets is inextricably intertwined with the ebb and flow of geopolitics” do? 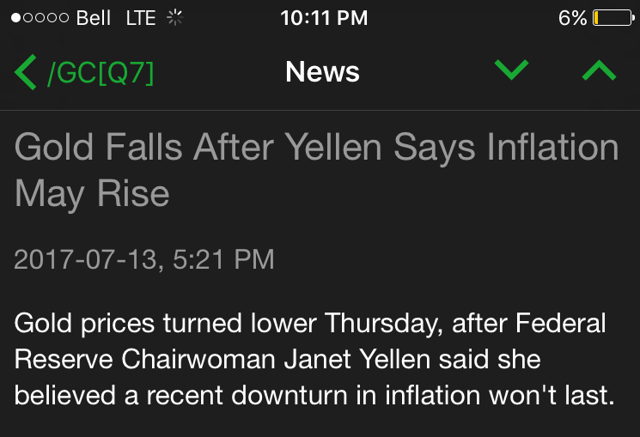 Well, in the rare times when the market does react in a “logical” way to the substance of the news, they highlight that front and center, and make sure we all understand how the market reacted logically to the particular news event. And, most will even claim that it is “obvious” that the news caused the market move, and imply that were are troglodytes if we do not accept this causative linkage. 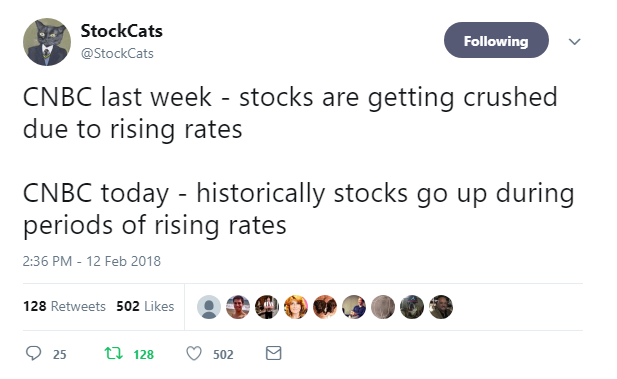 But, when the market does not react in a “logical” way (which is greater than 50% of the time based upon actual market history), they either ignore the news, or make up some other reason as to why the market ignored the news: “the market sold the news,” “investors shrugged off the news,” “the market already discounted the news,” “[another fundamental factor] was more controlling,” etc. So, in my humble opinion, this is not an intellectually honest way to analyze our markets. Now, for those that are still unconvinced, how many of you expected that the market should have hit its high at Brexit, or Frexit, or after the various terrorist attacks we experienced the past few years, or the Fed ceasing QE, or interest rate hikes, or the Trump election, etc.? Come on . . . at least admit it to yourself. The great majority expected each of these individual events to have “caused” the top to the market from a long-term perspective. Yet, even taken cumulatively over the course of the last two years, the market still experienced a 40% rally, and one of its strongest rallies in its history. At the end of the day, I think it is abundantly clear to anyone who is willing to look at the market from an intellectually honest perspective that the fate of markets is NOT inextricably intertwined with the ebb and flow of geopolitics. You see, the market has proven it just does not care if you have actually been listening to everything the market says, and not just pick and choose what you want to believe. So, as an investor, you have a choice. You can choose to continue reading analysis that ineffectively and hopelessly attempts to explain what the market did yesterday by fitting the square pegs of backward-looking linear reasoning into the round holes of non-linear market action. Or, you can recognize, as Alan Greenspan did, that markets are driven by “human psychology” and “waves of optimism and pessimism,” and learn how to track what really drives the market. It’s up to you.